«Northern Interindustry Company «The Alternative» Ltd produces unique heat exchange elements for regenerative air heaters of boiler units at power plants observing requirements of ОSТ 108.030.138-85 called «Rotary regenerative air heaters of stationary steam-boilers. General technical conditions». The baskets structure and the parameters of heat exchange elements have been worked out by thermal power engineer Vladimir D.Komiagin occupying himself with research work and practice in the field of boiler unit work perfection for more than 36 years, that gives an opportunity to produce a unique high-performance heat exchange elements. Heat exchange elements plates are made from low-carbon steel with 0.6-0.7 mm thickness in the hot end and 1.2 mm thickness in the cold end. The baskets bodies are integral by perimeter and made of sheet carbon steel of standard quality with 3 mm thickness for the hot end and 4 mm thickness for the cold end. Service life of any heat exchange elements to a considerable degree depends on its design peculiarities, fuel type used for the boiler, temperature of cold air fed to regenerative air heater, i.e. it depends on work of calorifers and many other reasons. 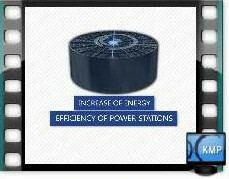 Service life of СМКА® heat exchange elements considerably exceeds the service life of standard heat exchange elements and could be greatly increased if apply additional measures that you could apply on your own or with our help. - certain storage conditions of regenerative air heater during standstill, and other measures for which we are ready to provide our recommendations. Aerodynamic resistance of the baskets produced by us is within the limits of acceptable values and coincides with the normative values. Structural design of the baskets produced by us differs significantly from the standard design, at the same time fully coinciding with the requirements of ОSТ 108.030.138-85. The baskets are assembled of the pairs of profiled sheets: a corrugated sheet and a ranging sheet having not only longitudinal embossings but also inclined waves between embossings. Waves height, their frequency, geometry and structural section are optimal and differ from standard ones. Parameters of heat exchange elements are defined precisely for each order depending on performance conditions of boiler units, i.e. fuel type and the presence of preliminary calorifer air heating. Sheets arrangement in the basket is radial. Baskets sizes are optimized in the layout that on average increases total inner section of the baskets by 3-4% (depending on regenerative air heater type) in comparison with the designed heat exchange elements. Accordingly, the section of spaces (i.e., shunts) between the walls of the rotor and the baskets is decreased by the same value. Engineered value of clearance between baskets casings and radial partition walls of the rotor is 7-8 mm per one side. If actual deformations of radial partition walls in rotor of regenerative air heater exceed these values, then this fact can be taken into consideration in design documentation during a certain order manufacture. Baskets structure presents no difficulty when mounting inside the rotor of regenerative air heater but allows to effectively overlap small shunts that have been left over between the walls of baskets casings and the cells of regenerative air heater rotor by pieces (i.e., joint bars) made of 2 mm thickness sheet fixed to baskets casings or to the rotor for providing leak-free overlap. Baskets casings are seamless by whole perimeter, optimizing their sizes in the layout together with quality sealing of all the gaps increase coefficient of elements’ heat-exchange surface use up to 0.9 – 0.95, that significantly exceeds the value for standard manufacture of the heat exchange elements (that is, practically, on average 0.5 – 0.65). The height of heat exchange elements sheets produced by us doesn’t exceed the value of 600-650 mm that allows to additionally intensify the surface of heat exchange elements in relation to the heat exchange elements with 1,000-1,200 mm height and to achieve this way more stable heat recovery in comparison with the designed one. Just because of this we have divided the hot end in two by height. It’s less technologically efficient for the production but gives unquestionable advantages during performance. 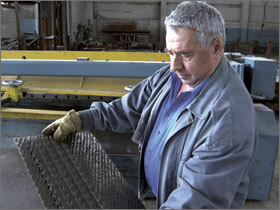 Heat-exchange sheets also have enhanced surface in the cold end and they are assembled into baskets by two, i.e. with longitudinal embossings and without them, just like in the hot end. In comparison with the typical cold heat exchange elements made of smooth sheets, heat-exchange capacity of the cold end of the offered heat exchange elements is 2 times better. Increased portion of heat recovery in the cold end not only increases heat recovery in regenerative air heater as a whole but also protects fuel gas dew point from penetrating into the hot end during burning high-sulfur fuel types and disadvantageous modes of boiler functioning. High-performance structural section of the heat exchange elements together with optimal basket height reduce the speed of the heat exchange elements contamination allowing to reduce cleaning of work surface of heat exchange elements as well as to do it with less effort, i.e. to reduce costs for service. Quality management system of «Northern Interindustry Company «The Alternative» Ltd is certified for conformity with ISO 9001:2008 by Certification Association «Russian Register» in International Network IQNet. The production of СМКА® heat exchange elements for regenerative air heaters is certified in EnCERTIKO system of RAO UES of Russia. The product manufacture is fulfilled according to the requirements of technical documentation and ОSТ 108.030.138-85.
increase of equipment service life. - in 2006 at Balakovskaya heat-and-power plant-4, TGC-7, running on natural gas, during repair of regenerative air heater РВП-54 of ТГМ-84 boiler No. 5, the heat exchange elements produced by us were installed. Heat-engineering tests took place after repair with involvement of the specialists from Saratov State Technical University. As a result of carried out tests, considerable improvement of boiler performance indices and possibility of gas economy up to 3,700-3,800 thousand normal m3/year were fixed, here recoupment period of total capital investment was less than 14 months. If you are interested, we are ready to forward you more detailed results of carried out tests. On your request we can also send you the figures of boiler functioning after installation of our heat exchange elements at Arkhangelsk heat-and-power plant and at the whole range of other plants and stations. We hope that the information offered by us is interesting to you. We are ready to e-mail you more detailed information on the questions you are interested in and also we can fax it or post it to you. will tell you more than you can hear now.